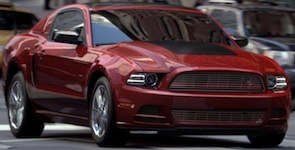 The 2013 Mustang Club of America Edition is an optional upgrade package for the V6 coupe or convertible which includes a billet style grille with tri-bar Pony badge, front lower fascia with fog lamps, 18 inch sterling gray metallic painted wheels, a unique side stripe, decklid spoiler, and Mustang Club of America front floor mats. Deep Impact Blue 2013 Mustang Club of America Edition Mustang convertible. It has the stone colored interior.